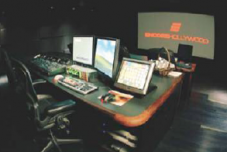 A Digital Intermediate room features a Kinoton FP30 ECII Studio Series electronic 35mm film projector, a Barco DP100 2KDLP digital projector and a da Vinci 2k Plus color correction system. A custom track system was developed to raise the projectors to 64″ and to permit either projector to be located on the optical centerline of the room or to do ‘butterfly’ projection of film and digital. AMX hardware/programming was installed to seamlessly integrate the A/V systems. Full digital signal path for the audio was implemented using QSC Basis/Rave signal processing system with amplifiers by QSC and speaker form JBL. Rydt was responsible for the design, procurement, logistics, installation and project management.